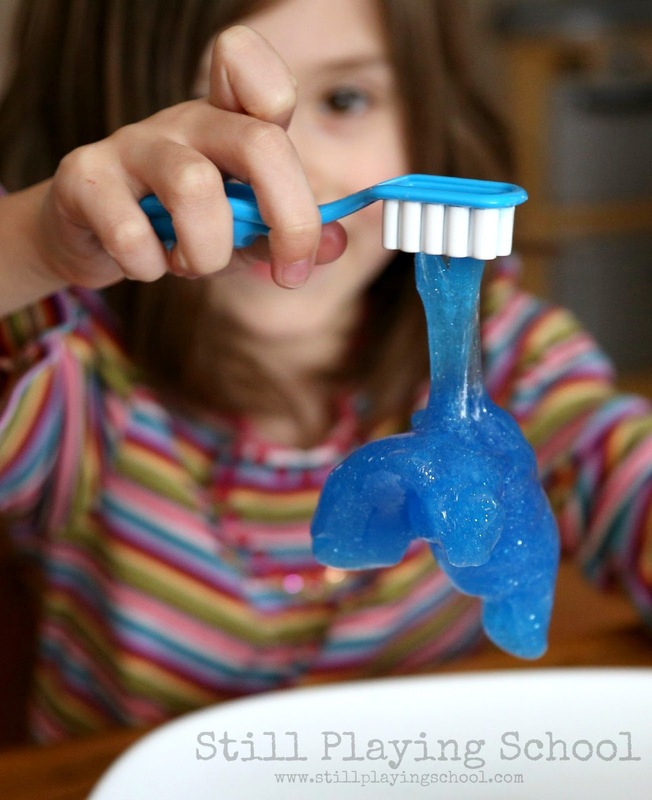 We created slime that looks just like toothpaste for Dental Health Month. It is the perfect material to invite kids to explore for fine motor, sensory, and pretend play! Our kids were closely supervised and know not to taste this slime but use your own judgement with your children. 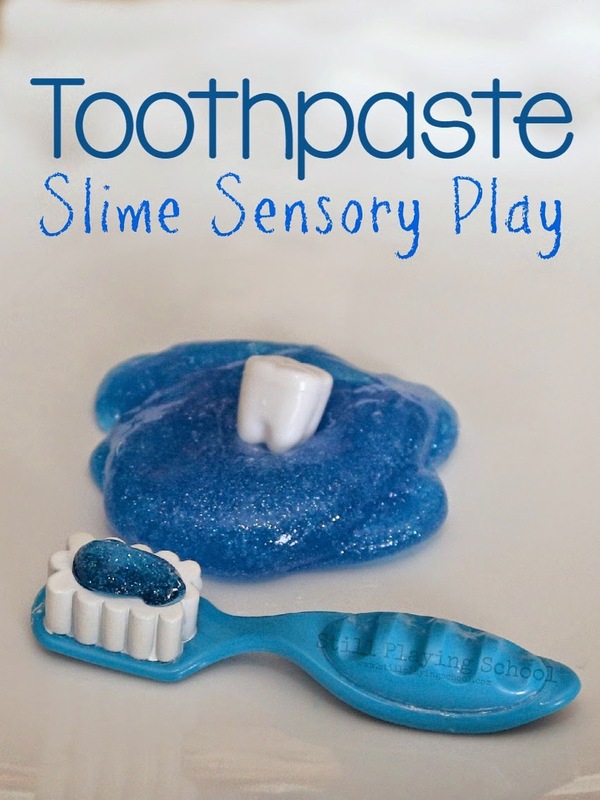 This sensory play is not recommended for children who still put things in their mouths or might think this is real toothpaste. 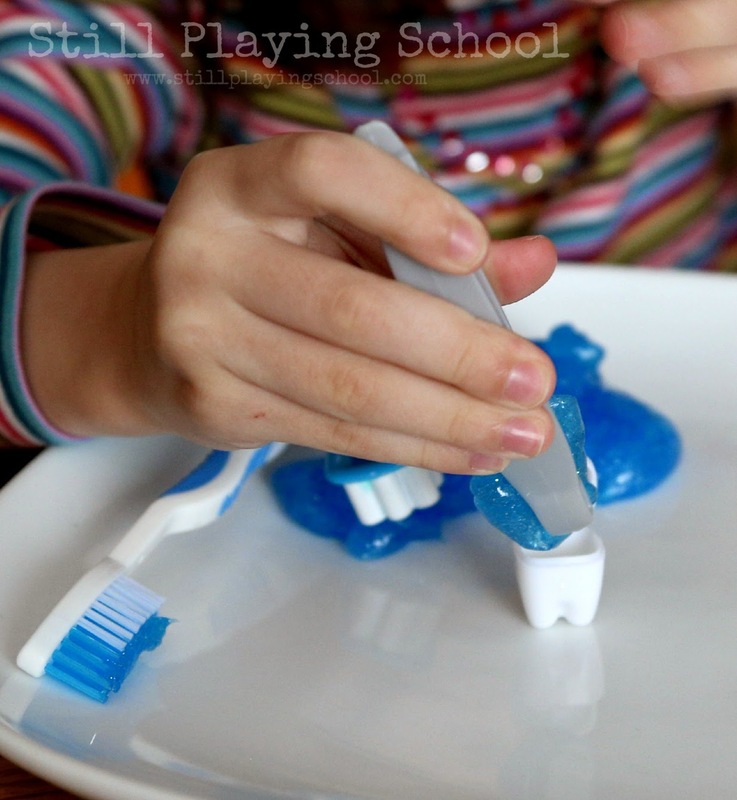 Last year to celebrate Dental Health Month in February we played with real toothpaste! This year we decided to make a fun sensory substitute. 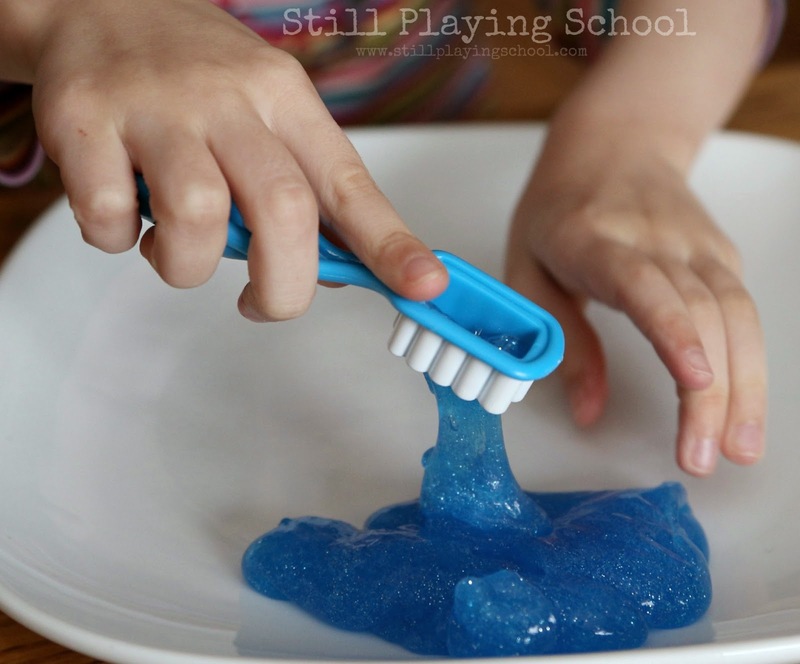 We always refer to Fun at Home with Kids' no fail slime directions when we are making our own! 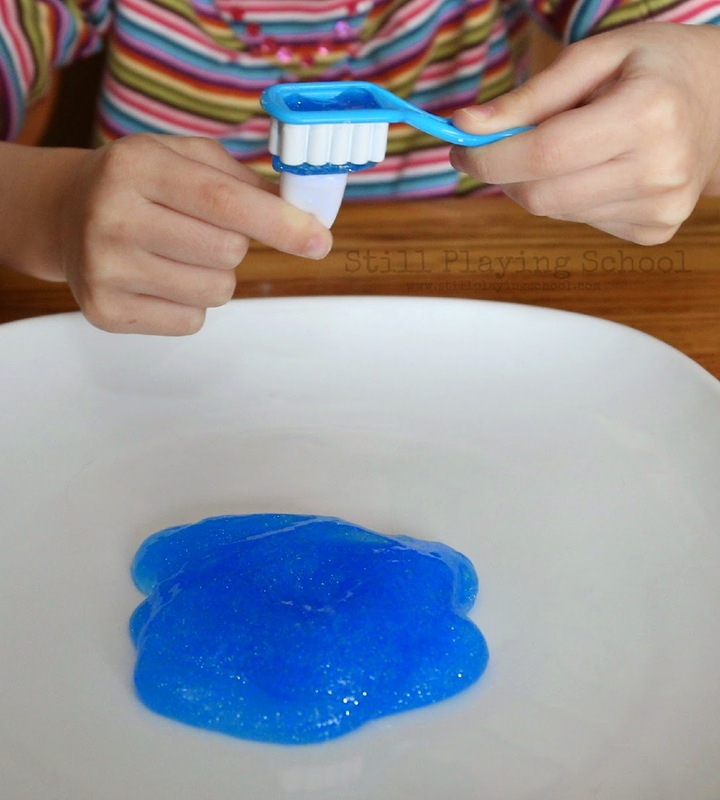 For this toothpaste slime we used clear glue. We colored the glue with turquoise and blue liquid watercolors and added super fine glitter. 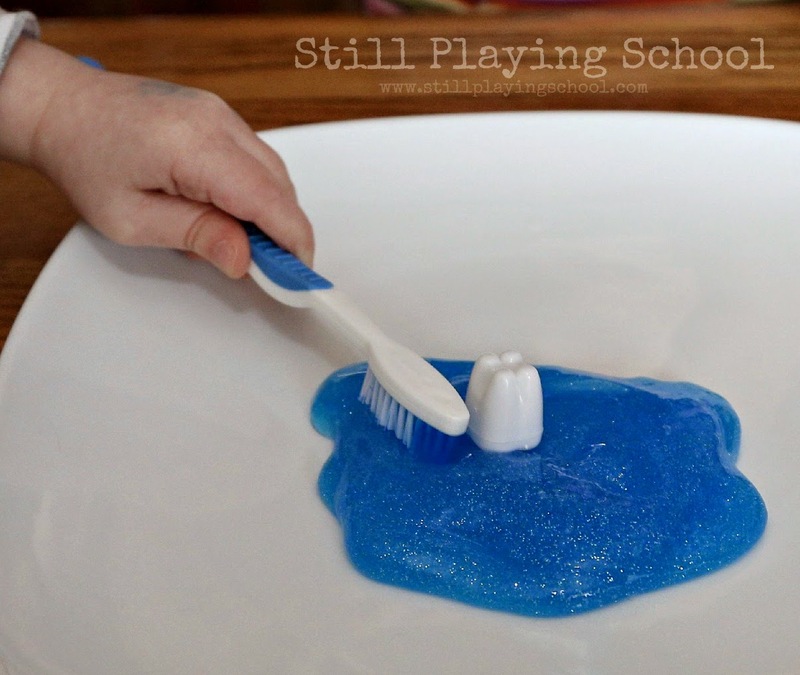 We mixed in liquid starch a tablespoonful at a time until it looked perfectly like toothpaste! 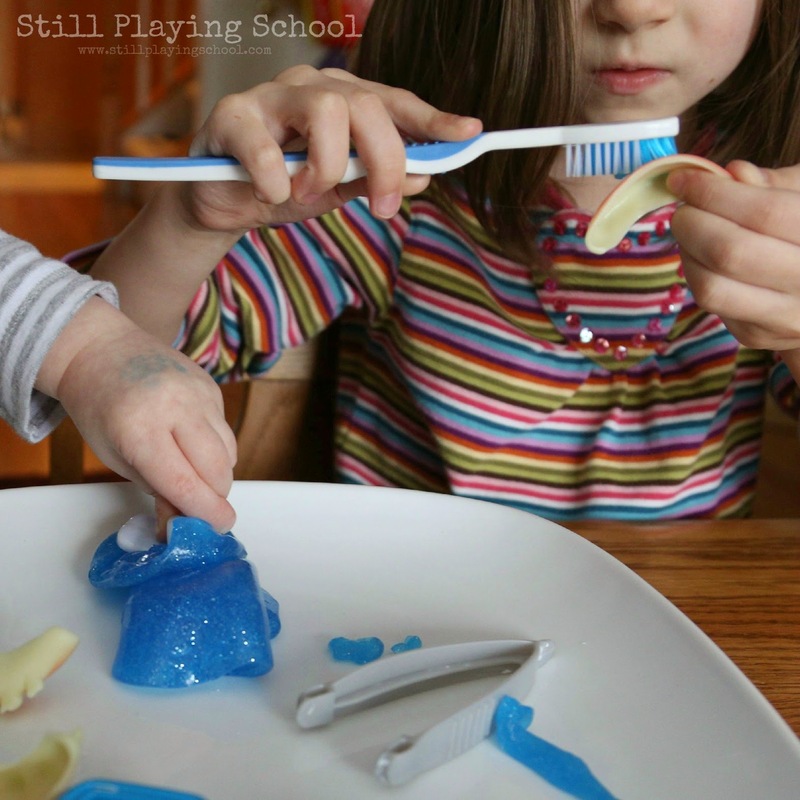 To present the invitation to play I set the toothpaste slime out with our dental play dough tools, plastic teeth, pretend dentures, and real toothbrushes. There was so much fine motor work for our preschooler and toddler. They pushed the toothpaste slime through the toothbrush and used the tweezers to fill the tooth holder, too! Our preschooler is interested in loose teeth since she has a few wiggly already and the Tooth Fairy is visiting her friends! She pulled the pretend teeth with the tweezers. The slime is stretchy but not sticky. 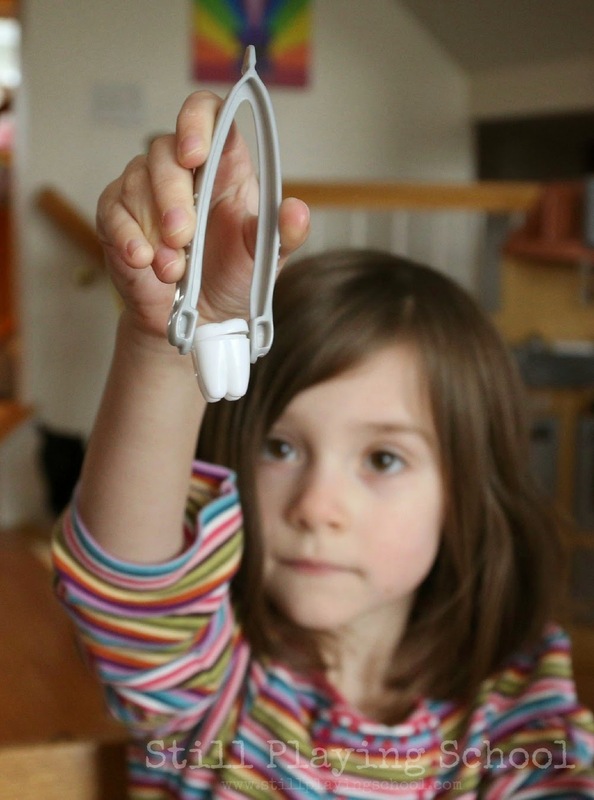 You can pinch off a bit for your pretend toothbrush. Slime is also fun to cut with scissors! They loved to practice brushing the pretend teeth. This was a great time to discuss how and why we brush our own teeth each day and night. Great way to explore Dental Health! So much fun... and the slime really does look like toothpaste! Oh my goodness how fun! I can't believe how much it looks like our toothpaste, awesome idea!! This really looks like toothpaste! So fun! I love how much it looks like real toothpaste! Totally adorable! We have some blue slime leftover and are going to have to play toothpaste for sure. I love this activity idea. 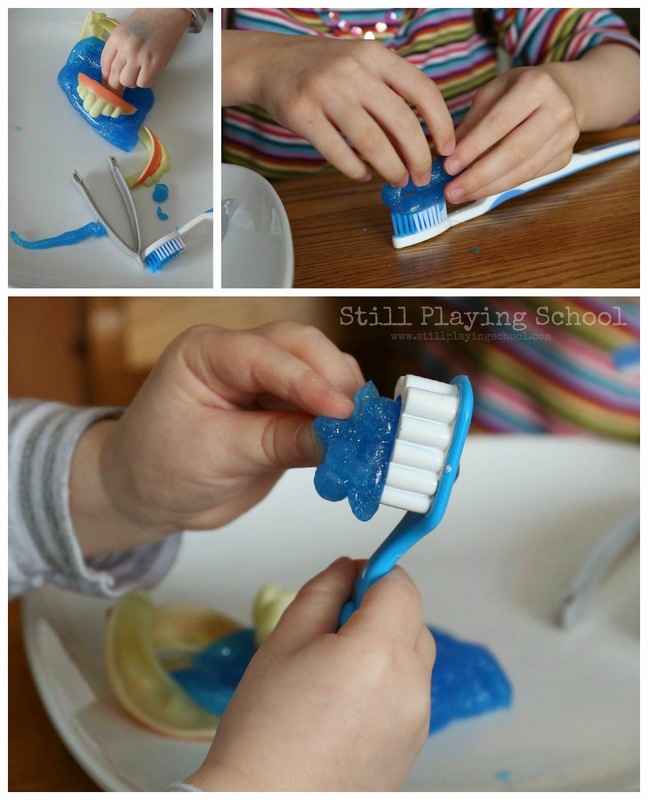 Anything that can make brushing and oral health fun for kids it a great idea in my book. Getting them started early can lead to a lifetime of great oral health.